1. Applicable every Monday in August 2017, while stocks last. 2. Purchase must be made with Starbucks Card. 3. RM1 will be charged for each upsize. 4. Applicable at all Starbucks stores except Genting Highlands, Tapah R-R and Sunway Lagoon kiosk. 5. Not combinable with other discount or promotion. 3. 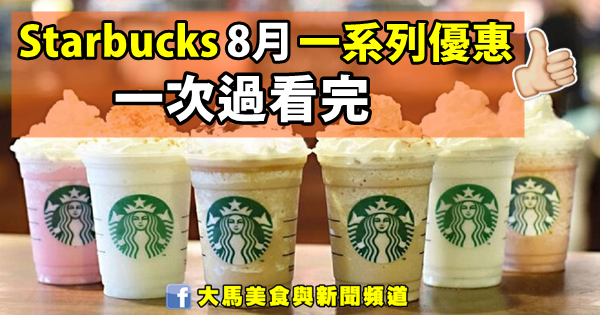 Valid at all Starbucks stores in Malaysia except Genting Highlands, Tapah R-R and Sunway Kiosk. 5. Summer Frappuccino is valid for Granola Dark Mocha Frappuccino, Acai Mixed Berry Yogurt Frappuccino and Banana Split Mocha Frappuccino. 1. Valid every Thursday in August, while stocks last. 2. Only applicable with the purchase of aGranola Dark Mocha Frappuccino, Acai Mixed Berry Yogurt Frappuccino and Banana Split Mocha Frappuccino. 3. Applicable at all Starbucks stores except Genting Highlands, Tapah R-R and Sunway Lagoon kiosk. 4. Not combinable with other discounts or promotions. 1. Valid every Friday in August 2017. 2. Purchase must be made with Mobile App. 3. Applicable at all Starbucks stores except Genting Highlands, Tapah R -R and Sunway Lagoon kiosk.